Candle lit dinners, cocktails by the fire and evenings spent with good friends; it seems like I will be spending less time in wellingtons and more time in high heels this month! Yes, it’s getting to be that time of year again, and my dance card is really beginning to fill up. I do love the holidays, and one of my favorite parts —beyond spending more time with the special people in my life— is the extra bit of shimmer and glow added to special occasions. 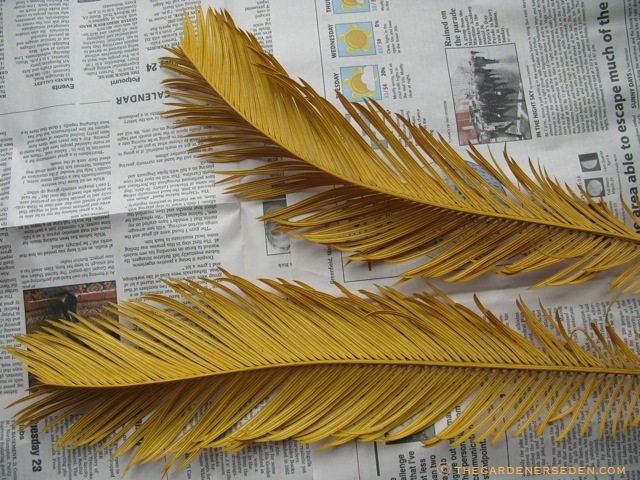 You will need: Dried garden remnants (see suggestions), pruners, newspaper, gloves, a mask, a well-ventilated work-space, spray paint (in gold, silver, bronze, copper, etc). Optional are: wire, wire cutters. Start the project by collecting clean, dry remnants from outdoors or indoor garden spaces. 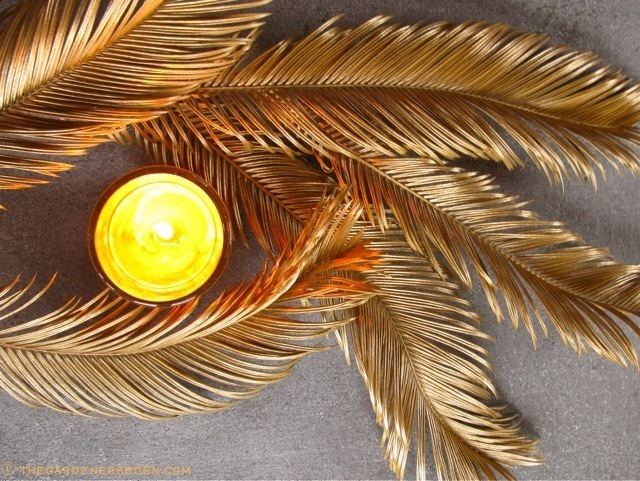 Pinecones, palm leaves, dried leaves, seed pods, nuts, dried flower heads, shriveled berries and gourds all look beautiful when lightly gilded with gold paint. Once you have collected a basket full of garden left-overs, bring them into a well-ventilated space. I work with paint in a studio equipped with a fan (and I also open doors and windows). You can use spray paint in a garage or cellar, or outdoors. Whatever you do, be sure to protect your clothes with an apron, your hands with gloves, your lungs with a mask and your floor or table with newspaper. Spread everything out on newspaper and pick the remants over. Check your leaves over for spiders and bugs and send those little guys back where they came from. Be sure everything is completely dry and solid enough to handle while painting and later, arranging. Clip off any wayward or unattractive pieces with pruning shears. 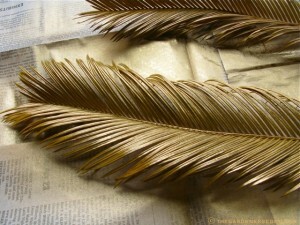 Select your spray paint (I like bronze, soft gold, copper, silver and pewter for gilding. I also like to use white spray paint on garden remnants and for even more drama, try black! 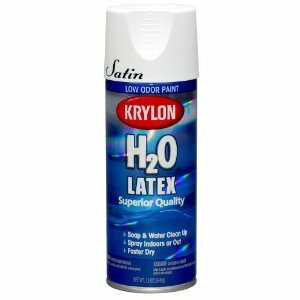 Krylon manufactures acrylic spray paints which are a safer-health option, and more environmentally friendly. In the United States, CFCs are no longer used in aerosol spray paints of any kind). Shake the can well and test on a spot of paper. Then spray over the dried bits and pieces in a steady, fluid motion. It’s better to use several light layers of paint than one big, heavy, globby one. Let the pieces dry for several minutes, then turn them over and do the other side. 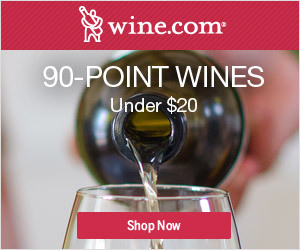 Some things —like pinecones for example— may need to be held up. Again, be sure your hands are protected with gloves, and grasp the cone with a bit of newspaper to hold temperamental bits steady. If you want to add more depth, use a couple of different shades of paint. white looks pretty with a light coat of silver, and brownish bronze looks nice with a bit of gold. I have seen “fuzzy” paints work well too. But keep in mind that just a touch of color often looks most elegant. You want to enhance the nooks and crannies on your garden remnants, but always let nature’s beauty stand out! Once everything is well coated in paint, let your remnants dry out for an hour or until you can handle them without smudging paint on your hands. Then, gather things up and start playing with your table arrangements. You can wire things together or leave them loose. If you are going to add candles to the table setting, be sure they are always behind glass, (and, just as a reminder, of course open flames are never left untended -especially with small children and pets!). 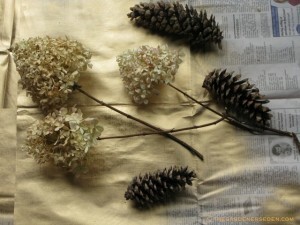 Gilded leftovers from the garden make beautiful additions to wreaths, door swags, or in vases. 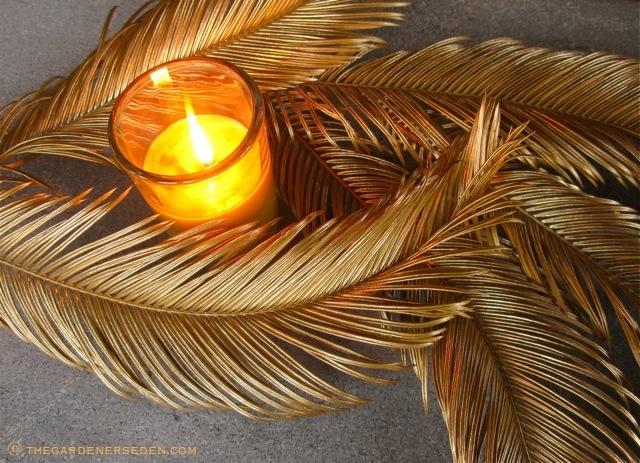 In addition to all-gilded arrangements, try combining a bit of shimmer with evergreen boughs or fresh flowers, dried berries and fruit and/or vegetables. Fresh pumpkins, squash and gourds also look pretty with gilded items from the garden. I like to reuse items from year to year, so I box them up and store them on shelves in my cellar. 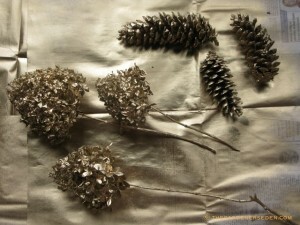 I have amassed quite a collection of pinecones, so I will be making a couple of gilded wreaths to give away as gifts. Because I’m always rearranging things, I like to leave my dried garden remnants loose when I store them in boxes, and I cushion the more fragile things with newspaper or bubble wrap. § 2 Responses to The Gilded Table: Shimmering Gold Garden Remnants Make Holiday Dinner Settings a Little Bit Glamorous…"
Hi Michaela, Having a bit of difficulty getting into the holiday frame of mind, what with the incredible temperature variations lately. Thanks so much for the simple beauty of your decorations… Oh, so glam with a “Gatsby” vibe. 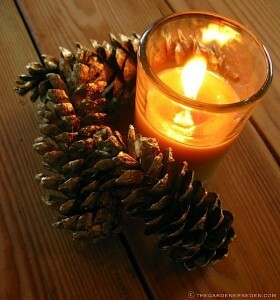 ; ) xo D.
and, of course, there’s nothing like the warm golden glow of candlelight. 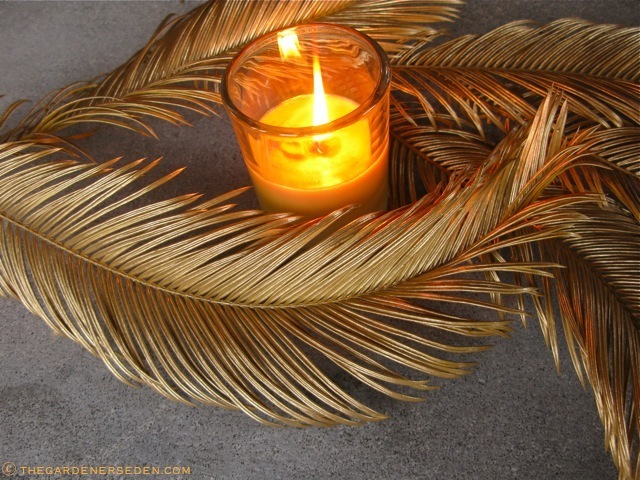 You are currently reading The Gilded Table: Shimmering Gold Garden Remnants Make Holiday Dinner Settings a Little Bit Glamorous… at The Gardener's Eden.